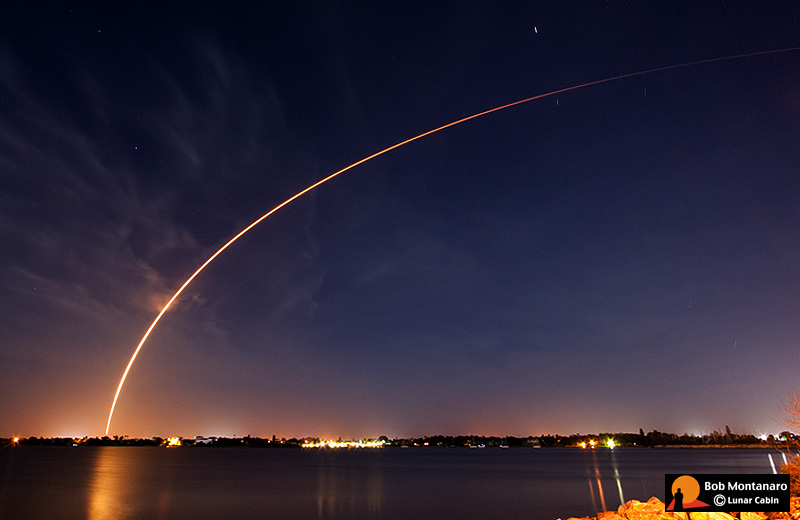 An Atlas V rocket lifts off from Cape Canaveral Air Force Station at 4:05 a.m. on 30 August 2012 carrying NASA's Radiation Belt Storm Probes (RBSP). The two probes, according to the NASA press release, will study Earth's Van Allen Belts, "...two donut-shaped regions encircling the Earth, where high-energy particles that have been energized by interactions with the Sun and space are trapped by our planet's magnetic field. The twin RBSP spacecraft will make measurements within the Van Allen Radiation Belts to help us to further understand the Sun's influence on the Earth and near-Earth space by studying the planet's radiation belts on various scales of space and time. RBSP enables the predictions of extreme and dynamic space conditions." This time exposure was taken from the Eau Gallie Causeway looking north-east across the Indian River Lagoon and barrier island.